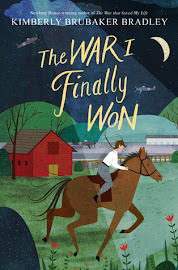 Even though this book received a lot of pre-Newbery buzz, if it hadn't ended up winning the medal, it would have been one of those books that quickly faded from my radar. In fact, it's very unlikely that I would have ever read it. But then, of course, it did win the Newbery medal, and that made me take a second look at it and also moved it to the top of my to-read list. The Newbery does things like that. Initially, I had no interest in reading this book because...well, I tend to be a little prejudiced against animal books. I blame it on the fact that I'm not much of an animal person myself. (Memories of the sheer agony and torture of suffering through Big Red in the fifth grade are flooding back to me now. I seriously thought I'd never make it through that book.) But I've also noticed that when I do force myself to read something with an animal as the main character, I like it better when the animal has a voice. And let me tell you, if there's one thing Ivan has, it's a voice. Ivan is a silverback gorilla. He was born in an African rain forest but was taken from his home (along with his twin sister) when he was still in his youth. He was purchased by a man named Mack and eventually came to live (along with several other exotic animals) at the Exit 8 Big Top Mall and Video Arcade where they perform shows at "two, four, and seven, 365 days a year." Ivan's best friends are an elephant named Stella and a stray dog named Bob. Ivan has discovered that the only way to survive is to forget what he has lost. But then Ruby arrives, a young elephant fresh out of Africa. And she forces Ivan to remember. Once he remembers, he knows he has to do something. 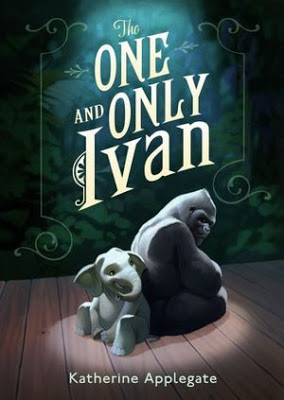 Although fictional, the foundation for this story is true: there really is a gorilla named Ivan (he currently lives at Zoo Atlanta--EDIT: Danzel brought to my attention that Ivan actually passed away in August of last year. I just assumed since the book was published last year that it was still accurate. Sadly, it is not. ), and for 27 years he lived in a cage in a circus-themed mall in Washington state. The real Ivan also loves to paint, just like the fictional Ivan. I love a story like this that has its roots in truth. (The Circus Ship, which I've raved about far too many times, is another one that used a true story as inspiration.) For me, if I know part of the story is true, even if it is just a very small part, it makes the whole story that much more fascinating. I have no idea what the thoughts of a real gorilla are like, but Ivan's own thoughts and words are pretty convincing. He is brusque and to-the-point ("Humans waste words. They toss them like banana peels and leave them to rot. "), and "brusque and to-the-point" is how I would describe real gorillas. But then, Ivan also has a personality that is distinctly his own: he is gentle but powerful, clever but sarcastic. He hides his pain while at the same time looking for ways to help others through theirs. He sounds like someone you might want for a friend except that he is guarded and distant when it comes to most humans. The fact that Ivan doesn't mince words meant that this book flew by. I'm visiting my family in Colorado right now, and I easily started and finished it on the drive here (with plenty of singing songs, dishing out snacks, and finding lost markers interspersed throughout). It looks like a decent length, but there is a lot of white space on the page. Ivan is short and concise throughout. Even if I wouldn't have changed it, another downside to Ivan's succinct voice is that a lot of the side stories never get fully fleshed out, nor do they really resolve themselves in the end. For example, there's so much we never learn about Julia and her hardworking father and her ill mother (but then, Ivan probably didn't know a lot about them either). Also, we never really learn Mack's complete story--why his marriage failed and if he was successful after the circus was shut down. Again, I think it was staying true to Ivan's voice to leave these threads hanging, but as a reader, I felt the gaps. As much as I loved Ivan (and Ruby and Julia and Stella), I think Bob (the stray dog) may have been my favorite character. He was not an act in the Exit 8 Big Top Mall circus show. Rather, he was an uninvited guest and most of the time stayed conveniently out of sight so that "mall workers long ago gave up trying to catch him." There was a small hole in one of the bottom corners of Ivan's "domain" (his word, not mine), and every night, Bob climbed through the hole and fell asleep on Ivan's large and comfortable stomach. Bob's lines were some of my favorite because he had a snarky side to him. One night, he and Ivan are having a little argument. Bob calls the billboard outside the mall a "monstrosity" since he's not on it. And Ivan reminds him that he's not in the show so has no reason to be on the billboard. Then Bob says, "Technically, I don't even live here. I am homeless by choice." By this time in the story, you know that this is the perfect line for Bob: a little self-righteous and indignant, and it's just funny when you picture a tiny little dog saying it. About a third of the way through the story, Ivan promises to take care of Ruby and find a safe home for her away from the mall. He becomes consumed with this promise and stays up night after night (much to the annoyance of Bob who wants him for a bed) painting a picture to express to Julia (or anyone who will pay attention) what he wants for Ruby. It never occurs to him that by providing a better life for her, he might provide a better one for himself as well. And then, when it happens, he's so surprised and a little taken aback. I thought this was a beautiful example of true, selfless friendship: even though he has lived in a small cage for many years, he never once thinks about changing that for himself. He only thinks of Ruby. All in all, it was a beautiful and touching story, well-told and expressed. And as I was writing this review, I remembered other animal stories I have read and loved (Mrs. Frisby and the Rats of NIMH, The Trumpet of the Swan, The Cricket in Times Square, to name a few), so guess I should take this as a lesson and in the future not be so quick to judge a book with an animal on the cover. P.S. 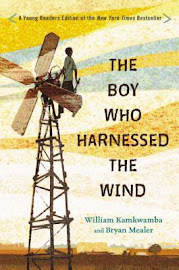 Soon after this book won the Newbery, I read a little statement from Katherine Applegate that I loved. She said she "recently found a scrap of paper, something she had written a few years ago. On it were the words, 'Should I give up on Ivan or not?' She [said], 'I was at one of those many places you get to in a book, where I say, "I just can’t make it work." For some reason this piece of paper stuck around. I’m going to have it framed.'" My mother saw the real Ivan a few times when she lived in Georgia. He moved to Zoo Atlanta in 1995, the same year she moved to the area. I remember she called me to tell me about the beautiful gorilla at the zoo, and how sad his life had been. He actually died last year. Amy, we are so similar! I am totally not an animal person either, and books with animals as the main characters drive me nuts. But this looks so sweet that I think I'll give it a shot. This sounds really good. I think you're review has convinced me. I love animals and especially love when they get a voice. I also love cheesy animalcentric movies. I really enjoyed reading your review. 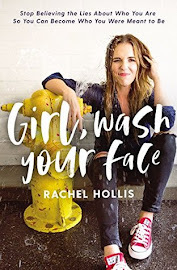 I just finished reading this book a couple of weeks ago and I really, really enjoyed it while I was reading, but like you, I feel like I've forgotten it already. I found it very moving as I was reading, but I've since read Wonder by RJ Palacio which just blew me away. Maybe that's why I feel lukewarm toward The One and Only Ivan now. Ivan's voice was exceptionally well written and the thoughts he has coupled with the events that take place seem totally plausible. I also felt that the one line, "Humans waste words. They toss them like banana peels and leave them to rot" was brilliant. What a thoughtful review. I read this book only because of the Newbery, too. I had mixed feelings about it, but agree that it was thought-provoking. Thanks for sharing at The Children's Bookshelf. I love that last story - new to me!